There's no magic formula to finding the right school. 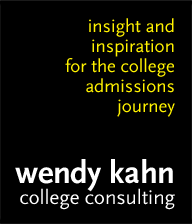 The key to a successful college admission outcome is careful planning. Wendy brings to her educational consulting practice the expertise she developed through her successful 20-year legal career. She guides students as they explore colleges that will provide the right fit and helps them brainstorm, develop, and polish essays and resumes that present "snapshots" of who they are. Wendy understands that students need plenty of support as they embark on one of the most important journeys of their young adult lives. By acting as a sounding board and offering a knowledgeable and sympathetic ear to both students and parents, Wendy helps reduce the stress that's a normal part of the process. The ideal time to begin the core process of evaluating colleges and crafting a college list is during junior year, but the beginning of high school is the time to start thinking about how colleges select their freshman classes.